Can I just tell you how close the marathon is? Wow! I'm thrilled that it is so close. Actually I wish I could be running it right now. Why aren't you here yet Saturday? Tuesday was a great day for a run with Kim. We had a little excitement when we saw a dog chasing a deer and got really worried that he would start coming towards us. Well he did start running toward, but we did spot the owners ahead on the path. Right away they yelled, "Don't worry, he's friendly!" It is still frightening when a large dog is running towards you. In general, I feel like dogs get more excited when they see someone running versus walking and want to chase you. A dog owner once told my mom his dog was friendly when she was walking, and then it bit her. Not so friendly anymore, huh? I know it is probably fun to let your dog of the leash, but unless you can guarantee me it is so obedient that it will always come when called, it probably should be on the leash. Okay that's the end of my rant for today. I had some weird stomach pains starting Tuesday night and all day Wednesday so I skipped my spin class after work for some quality couch time. I still have no idea if it was a touch of food poisoning or a stomach virus, but it didn't feel very good. Thankfully, it wasn't too terrible and I was still able to go to work and eat normally. Saturday's "long" run was supposed to be 8 miles but I had to cut it short because I had an appointment with my insurance agent. I also got a late start on the run because I was enjoying lounging around my parent's house a little too much. I figure the walking later in the day, especially the walk that involved carrying all my clubs up big hills made up for the fact that I cut it a bit short. It was still a bit chilly for a round of golf, but an extra jacket and a pair of gloves made it seem like the weather was just fine. 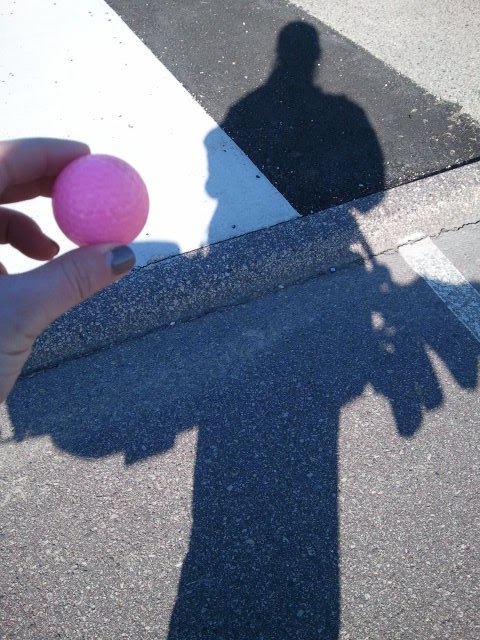 I even managed my first birdie of the year along with a few pars with my favorite pink golf ball. Of course, that ball also meet some cart paths and several trees on the course, but all in all it had a good day. Do you have any dog encounter stories? I've also been chased by a dog on my bike. It got my heart pumping, that's for sure!